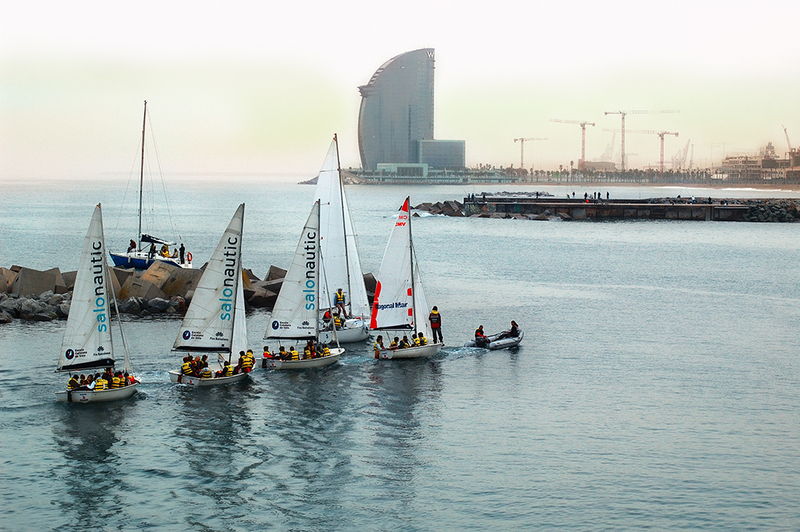 A group of sailboats coming out of Moll de Xaloc right in front of Hotel Arts and Torre Mapfre in Barcelona. What seems to be a class or an organized tour of some kind is towed by a zodiac towards open seas. In the distance the beautiful silhouette of Hotel W Barcelona also known as Hotel Vela (sail) by Ricardo Bofill. Bonita composición de esos barcos adentrandose en el mar abierto , y la silueta de ese impresionante hotel al fondo y el horiznte plagado de gruas de construcción. Hey! Wait for me! I want a sailboat ride, too! Glorious! Beautiful image. I truly enjoy your images and posts.